Of all the binoculars I have reviewed in the past, the Vortex Optics Razor HD Binoculars are by one of the most impressive I have come across. As a matter of fact, many people call them the best pair of binoculars they have ever used. If you give them a try you will see why. It is clear that this is an exceptional piece of equipment. It does come with a hefty price tag though. The important question though, is this the right binoculars for you? How good is the images? When it comes to things such as image quality, body quality and body stats, I give these a easy 9 out of 10. The first thing you notice when holding these is the quality of the materials used. They are literally oozing with quality. Images are clear, sharp and high in contrast. You won’t find many other binoculars that comes close to providing the same images like the Vortex Razor HD Binoculars do. The amazing view is a direct result of the high quality optical components and coatings being used. For example, Vortex uses a apochromatic lens design on these particular binoculars. To help you better understand what this means let me explain what happens when light passes through a single lens. When the light passes through there is a variation between the time the light hits the lens and the time it comes into perfect focus. And while not a huge dispersion, it is a significant one. This dispersion causes both chromatic and spherical aberrations. To minimize this problem designers will use the apochromatic lens design. Doing so brings the light of three different frequencies to one common focus. Doing so reduces the chromatic aberration and improves the spherical aberration. And when you add that to the fully multi coated anti reflection coatings, you see why this pair of binoculars is considered one of the best on the market today. One of my favorite things about this pair of binoculars is the fact they are both fog proof and water proof. They are made with toric joints which make them 100% water and air tight. This prevents dampness from getting inside. It also makes it very difficult for dust and other debris to get in side. But that’s not all. These binoculars are also argon purged. That means there is no air inside. It has all been removed and replaced with argon. This pretty much guarantees your lenses will never fog up. Generally speaking lenses will fog up when there is a lot of humidity or the temperature changes quickly. With these binoculars you will never have to worry about that. And thanks to the inside being completely moisture free, these binoculars will last a very long time. 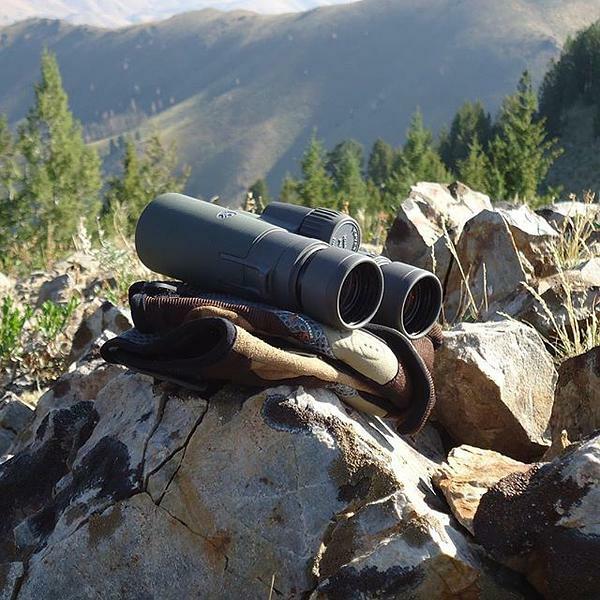 Choosing the right model in the Razor HD depends on what you will be using the binoculars for. Below a quick comparison on some of the vital statistics. If you don’t understand these numbers, you can skim over the table and continue reading for more information on choosing the right pair. The 8×42 presents a more stable image and a slightly wider field of view. The stability is often welcome for birdwatchers who require a steady hand to see detail, while the larger field of view (388ft) helps when trying to locate a moving object, like a deer or the ball at a sports event. It also the lightest in the Razor HD range. The 10×42 would be my recommendation for most. It makes for a great all round binocular. Not too heavy, and it still captures enough light to perform well at dawn and dusk. These are the perfect companion for the hunter and birdwatcher. The 10×50 is, in my opinion, too heavy to carry with you if you are stalking your prey, or if you are taking on a new hiking trail. Better suited to birdwatchers who spend a large part of the day seated in a concealed hide, but still like the ability to move around if needs be. If you do birdwatching or enjoy looking at the stars the 10×50 might just be the right binoculars for you. The 12×50 lets more light in, making it ideal for low light conditions. Take note, though that the 12×50 is big and hefty. You don’t want to be carrying this bad boy around all day. These will work nicely for those who spend alot of time in a hide. Whether you are waiting for elusive bird species, or the elusive trophy white tail, these will help you find it. This is a great option for those who are looking for a top-rated stargazing binocular. Where to buy at the best price and warranty? While you can pick up these up at any good outdoor store, I always recommend ordering through Amazon. Their service can’t be beat, and returns are easy. Amazon purchases in large volume, and this means that their prices are more often than not very competitive. The Razor HD comes with the standard Vortex VIP warranty. The VIP stands for Very Important Promise, which sounds like some marketing lingo. Don’t let that fool you. This bino is covered for life, and will be repaired or replaced free of any charge to you. You won’t need to fill out a warranty card, and you don’t even need to hang on to the original receipt. If something goes wrong, just get in touch with the Vortex people, and they will sort you out. You might expect me to say that the price tag on these aren’t justified. The truth is that these are very good value for money at this price. They are less than half the price of the Swarosvki EL. The Swaro might be considered by many to be the gold standard when it comes to binoculars, but the Razors are right up there in my book. When comparing the Vortex Optics Razor HD vs Swarovski EL, the more expensive EL comes with field flattener. Most binocular users won’t have heard of the term before, but it means the EL is sharper edge to edge. This is something very few people will notice, and paying double the price for the slight improvement in image quality, might not make sense to you. If I really had to nitpick (and I am struggling to find something here), I might complain about these being slightly bigger than something like the Zeiss Conquest HD. But while it is slightly bigger and slightly heaver, the optics are better in low and high light. The Razor wins every day of the week. Last but not least lets talk about price. If you are looking for binoculars on a budget, these are not the binoculars for you. I will be honest with you. They are not cheap. However, keep in mind they are made with the best materials and the best coatings. So when you think about that, you see the price is well worth it. If you are looking for a more affordable option, the Zeiss Conquest HD is a little less expensive and compare reasonably well. If you want to go even cheaper, and sacrifice image quality further, you can consider the Carson 3D ED around the $300 mark.